The work of the design house Zagato is usually noted for the company's iconic double bubble roofs. Today's Nice Price or Crack Pipe Lancia Zagato has a different kind of roof, but are you willing to burst the seller's bubble when it comes to its worth? Are you ready to rumble? I said, are YOU READY TO RUMBLE? Okay then, and you now ready to PAY FORTY LARGE FOR YESTERDAY'S 1988 Porsche 911 Carrera Cabrio? No? I didn't think so, at least based on the car's 77% Crack Pipe loss. Don't worry, if you haven't previously owned a Porsche, the seller won't want to talk to you anyway. The Italian marque Lancia and design house Zagato go together like piselli e carote. The two companies collaborated on a number of stunning automobiles over the years, including the Appia, Flamina, and the Fulvia Sport. Hmm, have you ever noticed that a lot of the names for Lancia cars sound suspiciously like they should be for parts of women's bodies that are usually covered by their bathing suits? Oh those saucy Italians. One of the last of the line was the Beta-based Zagato, or Spyder over on the Continent. These were built (to the tune of about 9,300) by the house of Z, but the car was in fact designed by Pininfarina. That design included an entire revamp of the greenhouse replacing the roof, back side glass, and rear window with a removable top panel and soft folding back. Of course cutting the cars up for the transformation was never all that hard as they were made of some of the thinest materials this side of a condom. The cars also tended to rust straight out of the factory so it was probably more of a tear at the perforation type of process. The remainder of these Betas' parts- interior pieces, mechanical systems, the will to live, all suffered from similar durability issues. In fact, these cars have the rep for being more tenuous than a Mission Impossible mission tape. That's all what makes this '82 so damn interesting, as it looks to be about as clean and intact as when it left the Zagato factory. Better in fact! Painted Ferrari red over a black vinyl interior, this Lancia is said to have only 58K on the clock. Even with that extroverted color scheme however, it's still so obscure a car that Auto Trader has it listed under 'null null.' The rest of the ad says that it was garage kept for seven years, but doesn't specify exactly which seven, or whether they were contiguous. The engine for these was a 2.0 DOHC Fiat unit with fuel injection and Lancia script on the cam covers. That 108-bhp four sits sideways under this Beta's hood and sends its horses through a five-speed manual operated via a stick so tall you might have to shoo golden goose seekers off of it. As noted, the quality of materials used in the construction of the Beta usually means that the interior over time becomes a riot of splitting seams, warping plastic, and gypsy campsites. This one looks awesome, and the wood-rimmed steering wheel is a nice touch. The exterior is equally clean and unlike yesterday's history-free Porsche, this show-car Lancia comes with all its paperwork. Well done Zagato man! Owning a Lancia is sort of like owning an Alfa Romeo, only without the onus of reliability. Parts are not all that easy to source any more, especially the unique bits, and as noted earlier they all do tend to try and seek metallurgical equilibrium if you so much as sweat on them. The last Lancias in the U.S. also lacked much of the panache and history of their predecessors, as Fiat ownership diluted the brand. Plus to be honest, there's not much that's special about the underpinnings of the Beta, it's just your typical FWD sidewinder four-cylinder. But there is something that is undeniably cool about the marque and its history, and this Zagato is an excellent example of what is undeniably one of the more interesting of the Beta models. Interesting and worth almost six-large are two different things however. 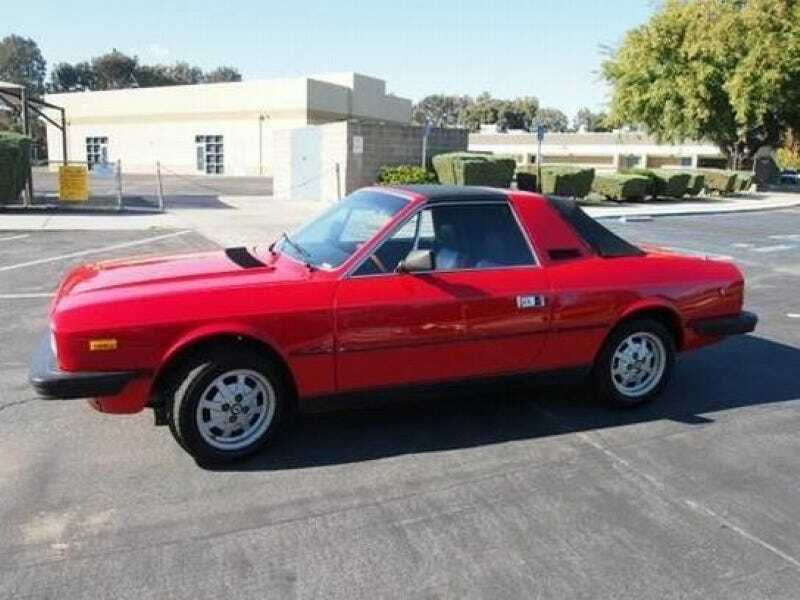 What do you think about $5,997 for this well preserved Lancia, does that work for you? Or, does that price make this Zagato a no-go? Auto Trader out of Orange County CA, or go here if the ad disappears. H/T to strokeofgenius for the hookup!